Last year, the NBA witnessed three rookies lead their respective teams into the playoffs. 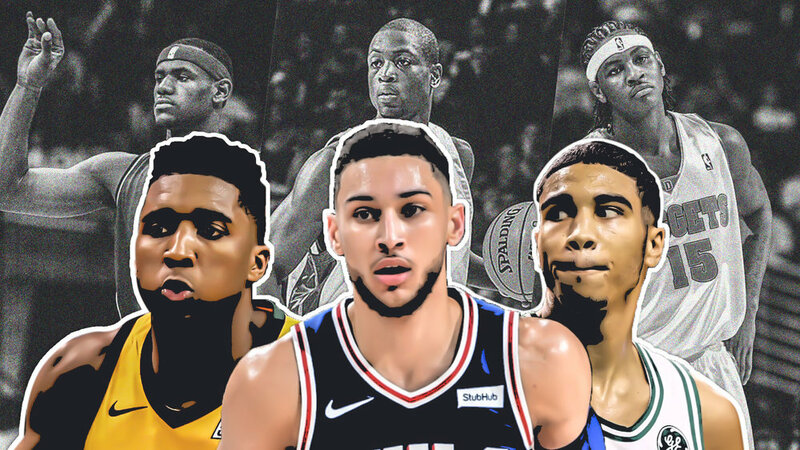 Donovan Mitchell, Ben Simmons, and Jayson Tatum all had remarkable rookie seasons and all had an impact in the playoffs. It is quite unusual to have a rookie, let alone 3 (in one season) make such an impact in the league. Before we analyze style of play, one similarity Mitchell, Simmons, and Tatum share, is explosiveness at the rim. All three showcased their LeBron-esque dunks and all demonstrated tremendous strength when attacking the rim. Without previous NBA experience, each provided great plays amongst the NBA's top talent. None, shied away from competing against the likes of LeBron James, Kevin Durant, or other NBA all-stars. Drafted 13th overall in the 2017 NBA draft, Donovan Mitchell led this group with 20.5 points/per game. Mitchell's offensive production helped the Utah Jazz land the 5th seed in the Western Conference with a 48-34 regular season record. All season long, Mitchell showed his acrobatic finishes and his massive put-backs. Mitchell has the nicest drives to the rim and consistently hit the "And 1". The most impressive thing about Mitchell is the manner in which he helped lead the Jazz into the playoffs with his offensive skill set. Ben Simmons helped propel the Philadelphia 76ers into the NBA playoffs with his stellar playmaking ability. The Sixers used Simmons as their point guard/small forward, much like the Cavs used LeBron James. Given his 6'10 frame, Simmons moved the ball effectively averaging 8.2 assists per game. In addition to sharing the basketball, Simmons averaged the second most points among these rookies, with 15.8 points/per game. The most surprising stat of all is Simmons 0% three point percentage. The rookie did not attempt a 3 point all season, which shows how determined he was on distributing the basketball and taking a high percentage shot. Did you know that Tatum and Simmons could have been teammates this past season? The Celtics traded their 1st overall pick in 2017 to the Philadelphia 76ers, to select Markelle Fultz. The Sixers could have kept their 3rd overall pick and have selected Jayson Tatum. Crazy right? Boston is eternally grateful for the outcome of this trade, which resulted in Tatum falling in their laps. The Celtics added a superstar player to an already loaded team. Out of the three rookies, Jayson Tatum is considered the best shooter, averaging a 47.5% field goal percentage. Tatum also proved to be the top rookie from beyond the arc, with a 43.4% three point percentage. You pair great shooting with great rim attack and you have an NBA star. At this point, it is difficult to project who will have the better sophomore season in 2018-19. Each provide something unique to their teams and each are a part of a unique team structure. If we must predict success, let's take a look at current team structures. Donovan Mitchell was single handedly Utah's best player last season. With a great supporting cast of Rudy Gobert, Derrick Favors, Jae Crowder, Joe Ingles and Ricky Rubio, Mitchell offered great play which elevated everyones game. Just recently, we saw the Utah Jazz select, Grayson Allen, who received instant support from Donovan Mitchell. When asked what Grayson Allen brings to the Jazz, Mitchell said, " when adding a guy like him, an elite scorer, a great guy, great defender, who plays unselfish, we gotta go with him, we're excited". In my opinion, I am not sure Allen provides the Jazz with difference making ability. Given the tough Western Conference, it will be very difficult to get far. I expect Mitchell to once again be the star in Utah and should be instrumental in several last second/come from behind victories. Out of these three rookies, I expect Mitchell to have the better season statistically, due to lack of scoring options for the Jazz. Ben Simmons showed how important he was to the development of the 76ers, as well as their success. Simmons who ran the offense, simply generated offense through passing and scoring. Although, Simmons success did not roll into the playoffs, it should be expected to see Simmons operate the offense more efficiently. Given an offseason to learn from his mistakes, he will become smarter when understanding certain defenses and should know what to do under certain situations. Not to mention, they still have their 1st overall selection, Markelle Fultz with a season under his belt and all core players remain with the team. It's uncertain to know what type of impact he will have but if the Sixers decide to pair Fultz and Simmons in the backcourt, it could prove to be a dangerous tandem in the East. Out of the three rookies, Jayson Tatum is in the most fortunate situation. Injuries to Gordon Hayward and Kyrie Irving paved the way for increased playing time as a rookie. Tatum took advantage of his opportunity and became a star amongst stars. With LeBron James departing for Los Angeles, the power in the Eastern Conference has shifted. The fascinating thing about the Celtics, is they were one win away from dethroning the Cavaliers as the Eastern favorite and without Hayward and Irving. Now, the Celtics become the power house in the Eastern conference. Adding Hayward and Irving with future all-star, Tatum, now gives the Celtics a massive NBA line-up. It is too early to tell whether they will match well against Golden State but this is a great start. I have a feeling Tatum's offensive production might drop next season, due to several scoring options. Regardless, Tatum is in prime position to play in future championship games, which could possibly result in a title. If anyone could go off in the NBA Finals, it is Tatum. He can go from an NBA all-star to a Boston legend.